Come along with us on a Royal Caribbean Independence of the Seas "All Access" ship tour! This is a 100% honest, 100% authentic review of our experience on the "All Access" ship tour aboard the Royal Caribbean Independence of the Seas cruise ship. Dadtography was not compensated in any way for this post. We paid for this cruise and the ship tour with our own, hard-earned money. All images are originals taken by Dadtographer Daniel. Please don't use our photos without permission. Any chance I get to go slightly off the beaten path or "behind the scenes" of how something works, I take it. Royal Caribbean offers an "All Access" ship tour for around $80, and I decided to go on our last sailing. Unfortunately, video wasn't allowed, but photography without the use of a flash was permitted, so I took a TON of photos during the tour. Check out my experience on this "All Access" ship tour aboard the Royal Caribbean Independence of the Seas! An intro to the Royal Caribbean "All Access" ship tour. Royal Caribbean offers an "All Access", behind the scenes tour aboard many of its ships. We went on a 6-day western Caribbean (Mexico) family cruise not long ago and were able to participate in one of these tours aboard the Independence of the Seas ship. I've been on a gallery tour on another ship before and that was whole lot of fun. A brunch was included in that tour, but no food or beverages are provided on the full ship tour. I figured I'd give a full ship tour a try this time. The "All Access" tour aboard the Independence of the Seas was on the last day of the sailing - a "day at sea" with plenty of time to explore the ship. I am unsure if the cost of the tour varies from ship to ship, but the cost on our sailing was roughly $80 USD. We booked it online after we made our reservations. For more information and the "official" Royal Caribbean page on ship tours, click here. for the All Access tour video. Original photos, edited exclusively using Skylum products. All of the photos you see on this blog post are originals taken by Dadtography photographer Daniel. We strive to use our own photos over stock, because that's a key element to telling our story. All of the photos you see here are edited using Skylum's Luminar 2018 (af) or Aurora HDR 2018 (af) photo editing software products. We like the combination of power and simplicity editing in these products provides us and we think that you'll like them, too! Both Aurora HDR and Luminar also have a risk-free 15 day trial, so give them a try. We think you'll like what you see. Aurora HDR is a high dynamic range specialty photo editing software. Luminar is a cost-effective photo editing suite. Use code DADTOGRAPHY for $10 off any Skylum product! Our "All Access" ship tour of the Royal Caribbean Independence of the Seas lasted for nearly four hours. It was a great experience, and we were able to see many areas of the ship normally off-limits to cruise ship guests. You can use the options below to navigation to specific sections of the ship tour. Come along with us to the deck 3 galley and our chat with Chef Wong. See how the Independence of the Seas stores all of that food for the entire voyage. Visit the environmental services area, including the incinerators and recycling. Visit the "brain" of the ship - the engine control room where all systems are monitored. See all of the hard-working crew in the laundry services area down below the ship's water line. Go up "top side" with a chat with the captain of the ship on the bridge. View all of the photos we took while on the "All Access" ship tour aboard the Royal Caribbean Independence of the Seas. Cruising isn't for everyone, but if you haven't tried it yet, it can be a great family travel option. If you need a reason to cruise, here are ten, off the top of our heads. The top two cruise lines in the world are Carnival and Royal Caribbean, but which is the better option. We answer this age-old question once and for all. It has always amazed me how they do what they do on cruise ships - especially when it comes to food. When you consider how many meals they prepare every day aboard a ship with 3,000+ guests and 1,000+ crew, the feat is almost astounding. I have a lot of respect for cruise ship culinary and kitchen staff, that's for sure. When you think about it, the people that run the kitchens and food prep on board a ship like the Independence of the Seas are probably some of the busiest on board. And yet, Chef Wong took time out of his busy day to take us on a tour of his main kitchen. Chef Wong showed us much of where the action occurs and explained a lot about how his kitchens stay so efficient, safe and clean. The 3rd deck kitchen is also the only bakery aboard the Independence. That means every scrap of bread, roll, pizza, biscuit or other bakery item comes from that kitchen. Chef Wong told us that 3,000 pizzas per day were made right there in that kitchen. The staff efficiency is unparalleled in a kitchen. They are just as well-oiled a machine as the engine! Chef Wong told us that 3,000 pizzas per day were made right there in that kitchen. Almost as amazing as how the ship's crew prepares the food and beverages for so many people every day is how they store everything, keeping it fresh and ready to go. This was the last day of our sailing, so the storage areas were a bit lower than they would be earlier on in the cruise. We were told ships can also take on additional supplies during stops at ports as well, depending upon how long the cruise itinerary is. Our sailing was only 6 days, so there was more than enough room for everything we needed for the entire trip. Here, you can see rooms and rooms filled with food and beverages ranging from fresh vegetables, meats and even a room full of ice cream! Be sure to check out the full photo gallery below for more photos from the food storage stop on the All Access ship tour! Yes, you read that right. We talked about poop on this stop. But more on that in just a moment. Anna was our guide on this portion of the tour. She is the ship's environmental services officer and she knew a lot about how the ship keeps itself clean and minimizes the impact on the environment, too. She showed us the ship's two incinerators, depicted in a photo below. One of the incinerators had just been replaced, and you can see crew placing approved materials into the incinerators to be burned into dust. Anna also explained all of the systems and protocols in place to make sure the ship maintains a low environmental impact as well. From "scrubbers" in the smoke stacks that remove pollution, to recycled water and other materials, it was good knowing that the ship isn't doing damage to the oceans and air. The one big question on everyone's mind when it came to the systems that run on board a cruise ship was - "Where does all of the poop go?" No, we're not 5 year olds, we're just curious. The short answer is that the "poop" (what's flushed down the toilets" came into the room shown here, is dried and then is burned. The water is run through multiple filtration systems and returned back to the ocean. Where does all of the poop go on a cruise ship? The engine control room really acts as a nerve center for a large cruise ship like the Independence of the Seas. Critical systems are monitored from this room, such as the engine and propulsion systems, cooling systems and even some environmental systems as well. I stared at the screens for a while and couldn't figure out what was going on, but the engineer officer did a great job of explaining why the room was so important. Before entering into the engine control room, we had to go through a full security process, including signing a waiver form and a metal detector scan. That's just how important this room is to the ship. Oh, and the security officers stayed in the room with us the entire time, too. 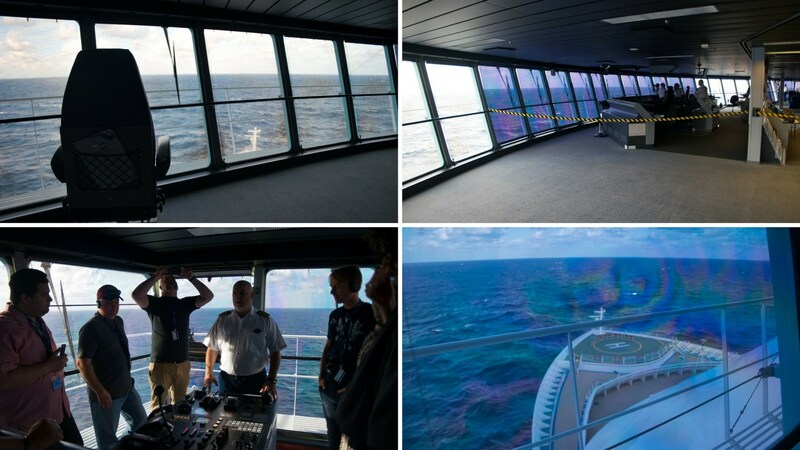 Depicted in the photos here are the crew actively monitoring all of the critical systems on board the ship. There's always someone in this room watching over everything ensuring the ship is running efficiently. There was a large table in the middle of the room with a schematic view of every deck of the ship. It was interesting to study the schematic a bit because most guests don't ever see all of the ship's decks. Deck zero isn't the lowest deck. In fact, the deck below zero on the Independence is called "Tween" deck. Be sure to check out more photos below from this area of the tour! Deck zero isn't the lowest deck on most cruise ships. Have you ever been below the water line on a ship? Seriously, I am pretty sure the laundry crew are some of the least appreciated, hardest working on the entire ship. First of all, they are below the water line in the ship. It's WARM down there, I can attest to that! Do you realize how much laundry is done every day on a large cruise ship? Think about it - cloth napkins, bed sheets and pillow cases... and all those towels from the pool deck! Everything has to get washed, dried and even pressed, and this crew does it all. The laundry services area of the ship is quite large. There are receiving rooms where dirty laundry comes down to be cleaned. The crew was caught up, so the receiving room was nearly empty when we went on our tour. There was a huge room with multiple washing "vats". They were larger than machines - they were huge! There were also industrial size dryers as well. Someone is required to manually load and unload these machines each time. The last part of this tour took us through where the linens are pressed, to remove the wrinkles. Crew members feed bed sheets and other linen through a machine, but it looked like all of the folding was done manually. Seriously, I am pretty sure the laundry crew are some of the least appreciated, hardest working on the entire ship. Last, but certainly not least, was our stop at the Bridge of the ship. This is where all the big wigs are, including the ship's captain - Captain Theo. I've been on a Bridge tour aboard the Independence's sister ship, the Freedom of the Seas. The bridge on this ship was nearly identical in almost every way. What was a bit different was the Captain Theo. He was a great story-teller, and told us about some of his 20-year history with Royal Caribbean. It was great hearing of his tales on the open sea, including a round-the-world sailing that took nearly 60 days! Click any photo below to view a larger version. Behind the Scenes Ship Tour - Beer Storage! We're running low? Behind the Scenes Ship Tour - That cooler is a cold -21 degrees! Behind the Scenes Ship Tour - Cold storage area "chophouse" must be meat? Behind the Scenes Ship Tour - Cold storage area "product of Australia"
Behind the Scenes Ship Tour - Cold storage "frozen mixed goods"
Behind the Scenes Ship Tour - Cold storage - that's ice cream! Behind the Scenes Ship Tour - Walking back down "I-95"
Behind the Scenes Ship Tour - Another long view down "I-95"
Behind the Scenes Ship Tour - That's the "sewer system" where the poop comes in! Behind the Scenes Ship Tour - The ship doctor's name is "Dr. Shore" ha! Behind the Scenes Ship Tour - "Designated restricted area" but I'm going in anyway! Behind the Scenes Ship Tour - That's a complicated looking system! Behind the Scenes Ship Tour - Engine control room panel. What's it all mean? Behind the Scenes Ship Tour - The Royal Way Delivering Wow every day. Behind the Scenes Ship Tour - We're headed down to laundry! Behind the Scenes Ship Tour - On deck 0 headed to "Tween" deck. Yes, it's called that. Behind the Scenes Ship Tour - Walking down below the water line to laundry. Behind the Scenes Ship Tour - Big washing machine spins. Behind the Scenes Ship Tour - Tour guide narrates laundry process. Behind the Scenes Ship Tour - "Laundry crew" hard at work! Behind the Scenes Ship Tour - I think those are dryers? Behind the Scenes Ship Tour - Laundry crew loading a dryer. Behind the Scenes Ship Tour - That's a gigantic load of laundry! Behind the Scenes Ship Tour - Back up above the water line. Behind the Scenes Ship Tour - Mostly empty laundry receiving room. They're caught up. Behind the Scenes Ship Tour - Huge room where the pressing is done. Behind the Scenes Ship Tour - Laundry crew running sheets through a machine. Behind the Scenes Ship Tour - Laundry crew running pillow cases through a machine. Behind the Scenes Ship Tour - Laundry crew works very hard and gets little credit! Behind the Scenes Ship Tour - Lots of big machines in the laundry area. Behind the Scenes Ship Tour - Piles of clean deck towels. Behind the Scenes Ship Tour - That's a linen press. Behind the Scenes Ship Tour - Another linen press. Behind the Scenes Ship Tour - Crew cabin doors are a different color than the others. Behind the Scenes Ship Tour - The captain of the Royal Caribbean Independence of the Seas Captain Theo watches our course. Behind the Scenes Ship Tour - Captain Theo explains navigating the ship. Behind the Scenes Ship Tour - Front of the ship from the bridge! Behind the Scenes Ship Tour - Facing the aft of the ship from the bridge! Behind the Scenes Ship Tour - Officers hard at work navigating. Behind the Scenes Ship Tour - Captain's chair? Behind the Scenes Ship Tour - "All Access" tour gift (knot tying guide). What do you think? Have you been on a "behind the scenes" tour of a cruise ship before? What did you see or learn? Got to go down below the ship's water line! The view from the bridge was awesome!